I'm a self taught programmer, I began programming back in 1991 using an IBM A10 mainframe with Pascal an Assembler IBM 360/70 emulator and Turbo C on a X86 PC, since that I work for the banking industry with emerging technologies like Fox Pro, Visual Fox Pro, Visual Basic, Visual C++, Borland C++, lately I moved out to the Airline industry, leading designing and programming in-house web applications with Flex, Actionscript, PHP, Python and Rails and in the last 7 years I focused all my work in Java, working on Linux servers using GlassFish, TomCat, Apache and MySql. WebSocket is a computer communications protocol which is designed to be implemented in web browsers and web servers, but it can be used by any client or server application. The WebSocket Protocol is an independent TCP-based protocol. Its only relationship to HTTP is that its handshake is interpreted by HTTP servers as an Upgrade request. The WebSocket protocol makes more interaction between a browser and a web server possible, facilitating the real-time data transfer from and to the server. This is made possible by providing a standardized way for the server to send content to the browser without being solicited by the client, and allowing for messages to be passed back and forth while keeping the connection open. In this way, a two-way (bi-directional) ongoing conversation can take place between a browser and the server. The communications are done over TCP port number 80, which is of benefit for those environments which block non-web Internet connections using a firewall. The WebSocket protocol is currently supported in most major browsers including Google Chrome, Microsoft Edge, Internet Explorer, Firefox, Safari and Opera. 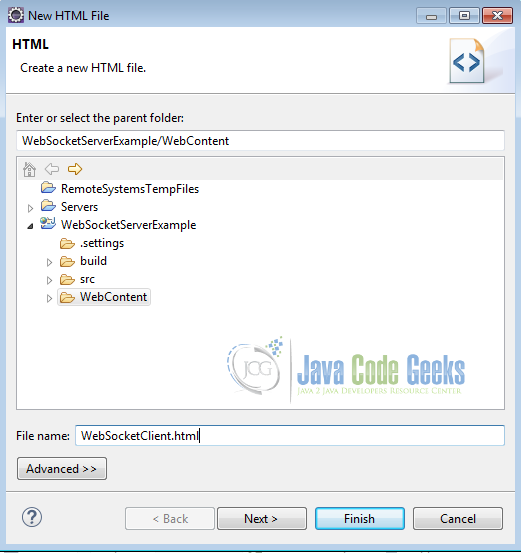 WebSocket also requires web applications on the server to support it. 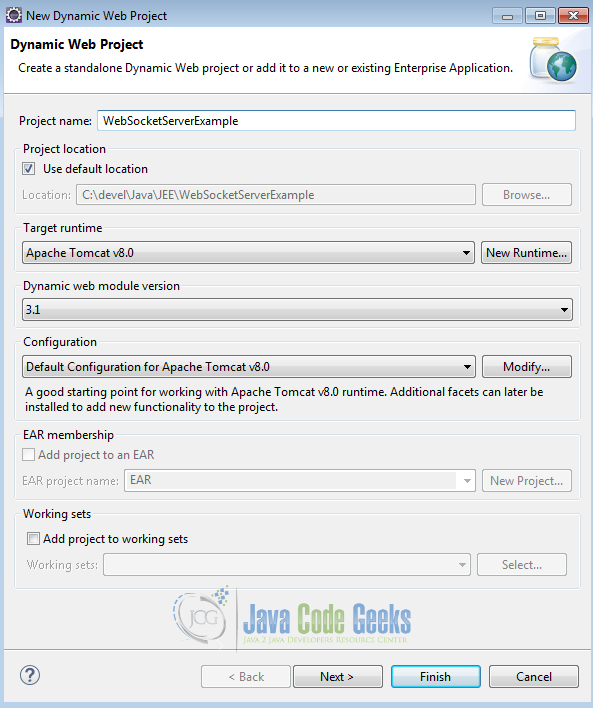 In this example we are going to show you how to use Apache Tomcat to establish a client server WebSocket connection. We are going to write a simple echo client server application and deploy it on Tomcat. 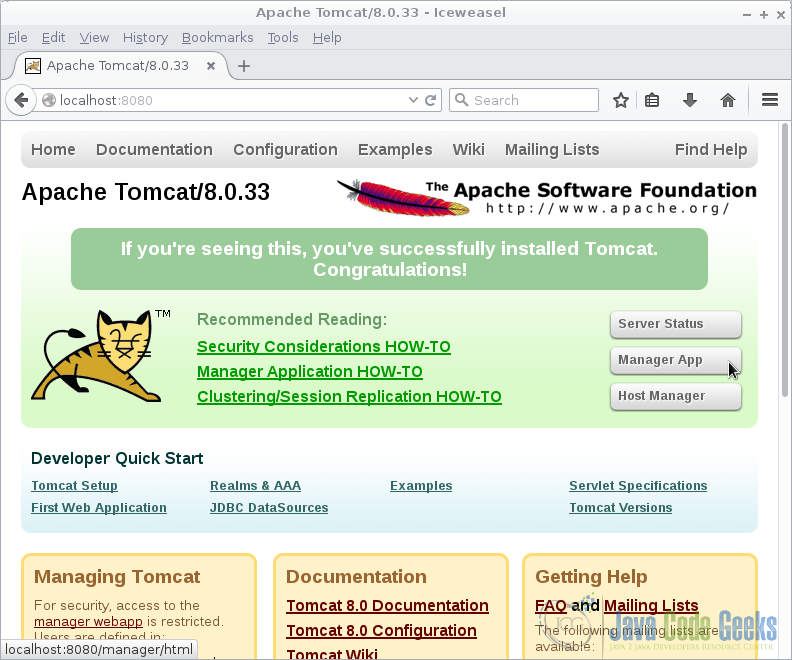 Go to the page https://tomcat.apache.org/download-80.cgi and download the tomcat server as a zip compressed file for windows. Choose an installation directory and uncompress the Tomcat server in its own directory. 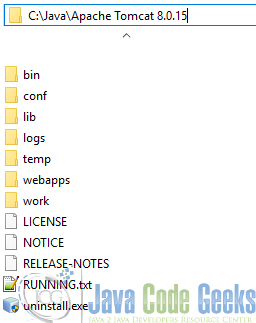 Open the Windows terminal and go to the Tomcat Installation bin directory. 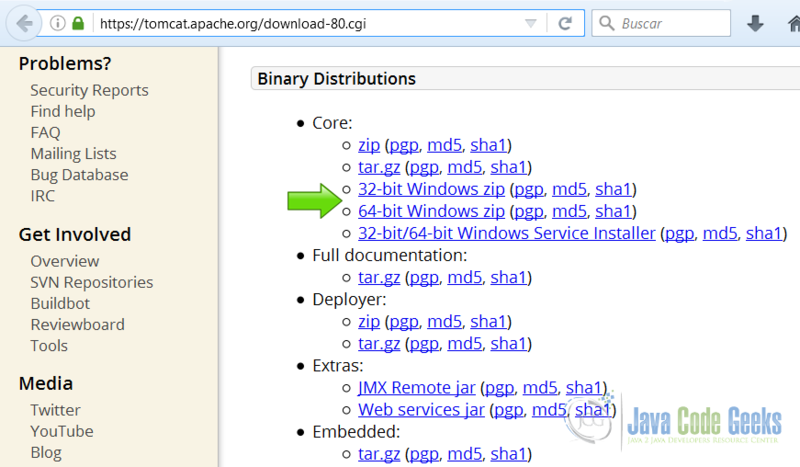 Using CATALINA_HOME:    "C:\Java\Apache Tomcat 8.0.15"
Using CATALINA_BASE:    "C:\Java\Apache Tomcat 8.0.15"
The service 'Tomcat8' has been installed. Open the browser in the URL: http://localhost:8080 and you should see the Tomcat Welcome screen. We are going to create a new WebSocket server, open eclipse and create a new dynamic web application from the menu. Name the application and press finish. Create a new class with right click on the project menu. Name the class and press finish. This class level annotation declares that the class it decorates is a web socket endpoint that will be deployed and made available in the URI-space of a web socket server. The annotation allows the developer to define the URL which this endpoint will be published. 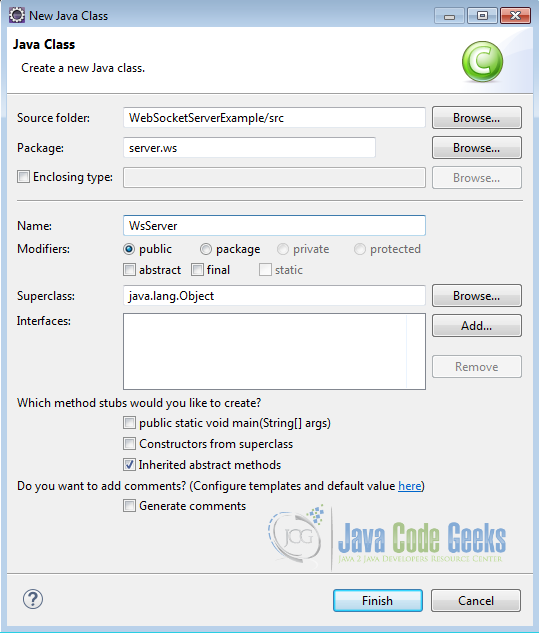 Server endpoint classes are Plain Old Java Objects that are annotated with javax.websocket.server.ServerEndpoint. @OnOpen annotation is used on a @ServerEndpoint method, but only once per endpoint. It is used to decorate a method which is called, once new connection is established. @OnClose annotation is used on a @ServerEndpoint method, but only once per endpoint. It is used to decorate a method which is called, once the connection is being closed. @OnMessage annotation is used on a @ServerEndpoint method, but only once per endpoint. It is used to decorate a method which is called, once new message is received. @OnError annotation is used on a @ServerEndpoint method, but only once per endpoint. It is used to decorate a method which is called, once Exception is being thrown by any method annotated with @OnOpen, @OnMessage and @OnClose. 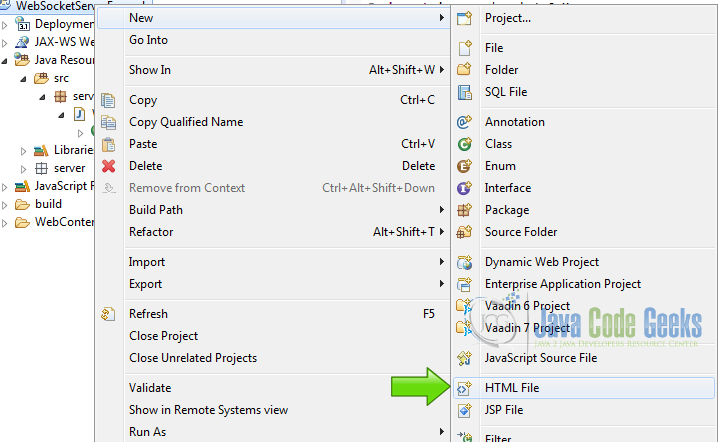 Right click on the project and choose New HTML File. Write the name of the HTML file and click finish. This form has an input text to write the message that we are going to send to the server. A button to send the message and a button to close the connection. In this text area we are going to write the echo from the server. Open the web socket connection. Assign the functions to the webSocket we created before. When we open the page the text “connected” is written to the text area. When the button echo is clicked this function is called and it invokes the send method of the web socket class with the value of the textbox as a parameter. Also we write to the text area. Get the WebSocket message from the server and send it to the text area. Capture the close event and write a message to the text area. If we get any errors we write them to the text area. Right click on the project folder and choose Run as -> Run on server choose Tomcat 8 server and click finish. The WebSocket is opened when the page is loaded. Everytime you write a text in the textbox, the message goes to the server and the latter sends the echo message response. This was an example of: Tomcat WebSocket. Very clearly written article. I could create a server based on code you posted and test with HTML client code taken from somebody else’s post on websocket that I already had. Worked without any problem. Thanks a lot!